Ortho Molecular Products Hormone/Glandular Support - EstroDIM - 60. Did you know there are even more benefits to a healthy lifestyle than you may have initially thought? Growing up&sbquo; you learned that it was important to eat your vegetables. Now&sbquo; it turns out vegetables do more than just help you grow through adolescence; it seems that getting in your recommended daily servings can not only help your Body to function more efficiently&sbquo; but potentially fight off illness. The formula contained in EstroDIM capsules actually one of the only formulas available to the public that combines several of the essential components of vegetables in one easy dose. With Ortho Molecular Products&rsquo; EstroDIM&sbquo; you can once again enjoy some of the benefits of eating your greens&sbquo; even when you don&rsquo;t have the time to sit down and prepare them. One of the most useful nutrients in this supplement is a substance called Indole-3-carbinol&sbquo; or I3C. I3C is naturally found in leafy&sbquo; green vegetables like cabbage&sbquo; brussels sprouts&sbquo; broccoli&sbquo; and kale. It has a component in it called Diindolylmethane&sbquo; which is naturally produced when your body breaks down I3C and known for its health benefits. Scientific studies have shown that I3C can help promote hormonal balance. Every capsule of EstroDIM also contains calcium d-glucorate. During the body's detoxification process&sbquo; metabolites can become harmful right before they're eliminated from your body. When the glucarate provided by calcium d-glucorate is absorbed&sbquo; it inhibits these toxins and reduces their ability to do further harm. 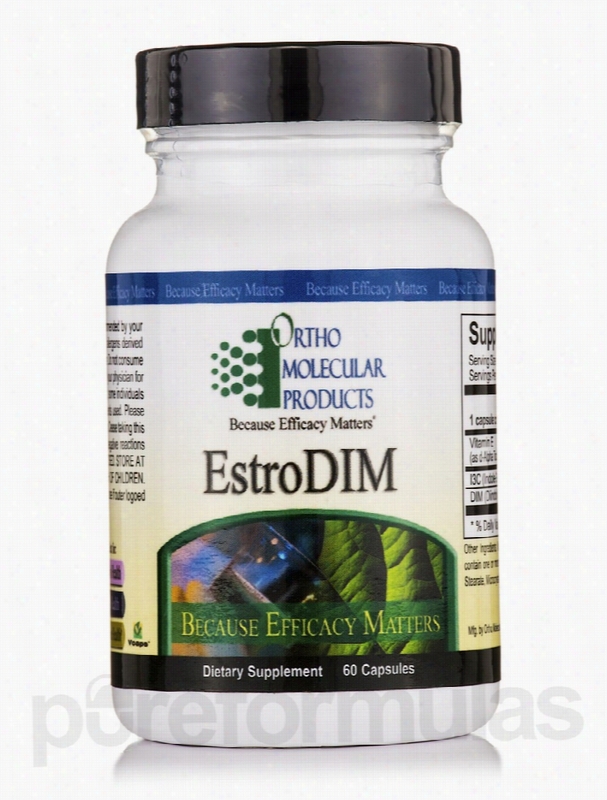 Each bottle of EstroDIM by Ortho Molecular Products contains 60 capsules. Ortho Molecular Products prides itself on making effective supplements from scientifically designed formulas. For over 20 years&sbquo; they&rsquo;ve been providing proven products with superior raw ingredients. Their manufacturing practices rise above industry standards and regulations. The most important priority for Ortho Molecular Products is that those who use its supplements get and stay healthy as soon as possible. These statements have not been evaluated by the Food and Drug Administration (FDA). These products are not meant to diagnoseÃ¢ÂÂ treat or cure any disease or medical condition. Please consult your doctor before starting any exercise or nutritional supplement program or before using these or any product during pregnancy or if you have a serious medical condition. Ortho Molecular Products Hormone/Glandular Support - AdreneVive - 60. AdreneVive is a dietary supplement that works to support your adrenal glands. Stress is often thought of as a psychological condition. However&sbquo; it usually affects us physiologically&sbquo; as well. Your adrenal glands are particularly susceptible to stress&sbquo; ironically due to their role in reducing its impact. When you&rsquo;re stressed out&sbquo; your Body produces hormones to help you survive the stress; it then creates cortisol&sbquo; another hormone it uses to lessen the amounts of the previous hormones still floating around in your system after they&rsquo;ve served their purpose. Unfortunately&sbquo; the human body is often unable to maintain the right hormone levels if you&rsquo;re constantly anxious and never get the chance to calm down. This can result in anxiety and sleeplessness. The inability to maintain normal hormone levels that this indicates leads to adrenal fatigue. Ashwagandha is AdreneVive&rsquo;s main ingredient. This natural herb is a type of adaptogen&sbquo; meaning that it may have normalizing effects on certain hormones. Eleuthero root extract is also thought to be an adaptogen&sbquo; so it provides similar stress relief benefits. It&rsquo;s also used to stimulate your immune system&sbquo; possibly protecting you from infections. Meanwhile&sbquo; Rhodiola rosea root extract may reduce fatigue&sbquo; boost your mood&sbquo; and improve nervous system functioning. L-Theanine&sbquo; another ingredient&sbquo; is commonly found in green tea. It has been used as a relaxation and calming agent; it works by naturally promoting increased dopamine and serotonin production. 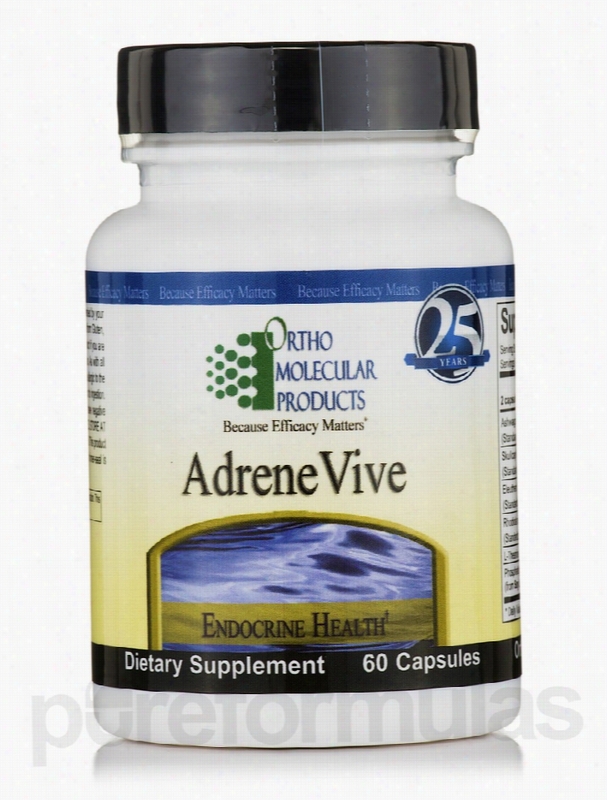 AdreneVive by Ortho Molecular Products comes in a 60-capsule bottle. To further ease your mind&sbquo; it&rsquo;s free of gluten&sbquo; yeast&sbquo; artificial colors&sbquo; and fake flavors. Ortho Molecular Products prides itself on making effective supplements from scientifically designed formulas. For over 20 years&sbquo; they&rsquo;ve been providing proven products with superior raw ingredients. Their manufacturing practices rise above industry standards and regulations. The most important priority for Ortho Molecular Products is that those who use its supplements get and stay healthy as soon as possible. These statements have not been evaluated by the Food and Drug Administration (FDA). These products are not meant to diagnoseÃ¢ÂÂ treat or cure any disease or medical condition. Please consult your doctor before starting any exercise or nutritional supplement program or before using these or any product during pregnancy or if you have a serious medical condition. 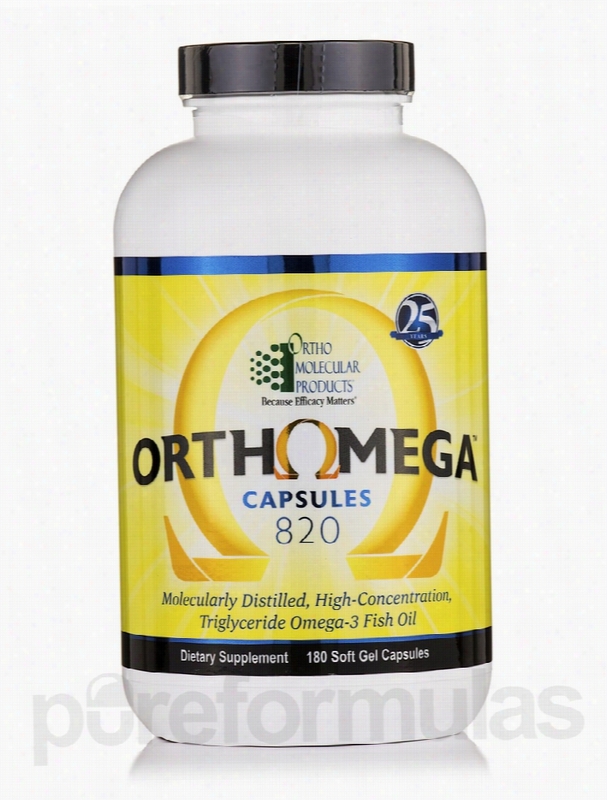 Ortho Molecular Products Essential Fatty Acids - Orthomega 820 - 180. Strong cardiovascular&sbquo; musculo-skeletal&sbquo; and immune systems can guarantee you a healthy body. These systems all require omega-3 fatty acids in order to function properly. The main source of these fatty acids is pure fish Oil. However&sbquo; you may not eat enough fish keep your omega-3 levels sufficiently high. If your diet is lacking&sbquo; taking a fish oil supplement like Ortho Molecular Products&rsquo; Orthomega can help ensure a healthy heart&sbquo; active immune system&sbquo; painless joints&sbquo; and healthy skin and eyes. These fatty acids may support growth and development in children. Meanwhile&sbquo; omega-3 supplements may positively impact the mood and concentration of kids and adults alike. Orthomega by Ortho Molecular Products can enhance your health when taken in combination with a healthy diet by giving you the essential fatty acids your body needs. Some of the ingredients contained in Orthomega include: EPA (Eicosapentaenoic acid)&sbquo; an omega 3 fatty acid that promotes the aggregation of platelets&sbquo; which are cells that cause blood clotting DHA&sbquo; which is responsible for promoting optimal brain functioning Purified marine triglyceride concentrate&sbquo; which may promote healthy levels of fat in the body Vitamin E mixed tocopherols&sbquo; which act as antioxidants by reducing the rate of oxidation in your cells Gelatin&sbquo; which may work to strengthen your joints&sbquo; improve the quality and appearance of your hair&sbquo; and shorten recovery time Glycerine&sbquo; which enhances beautiful skin and hair Purified water&sbquo; which is a natural solvent for mixing the ingredients. Take at least one capsule a day&sbquo; unless otherwise directed by a physician. One bottle of 180 Orthomega soft gel capsules should last for up to six months. For over 20 years&sbquo; Ortho Molecular Products has been using raw ingredients to make effective supplements that have been scientifically proven. The production practices surpass the industry standards and regulations making the company utterly commendable. The major priority for Ortho Molecular Products is to ensure that anyone who uses its supplements gets and stays healthy as soon as possible. These statements have not been evaluated by the Food and Drug Administration (FDA). These products are not meant to diagnoseÃ¢ÂÂ treat or cure any disease or medical condition. Please consult your doctor before starting any exercise or nutritional supplement program or before using these or any product during pregnancy or if you have a serious medical condition. 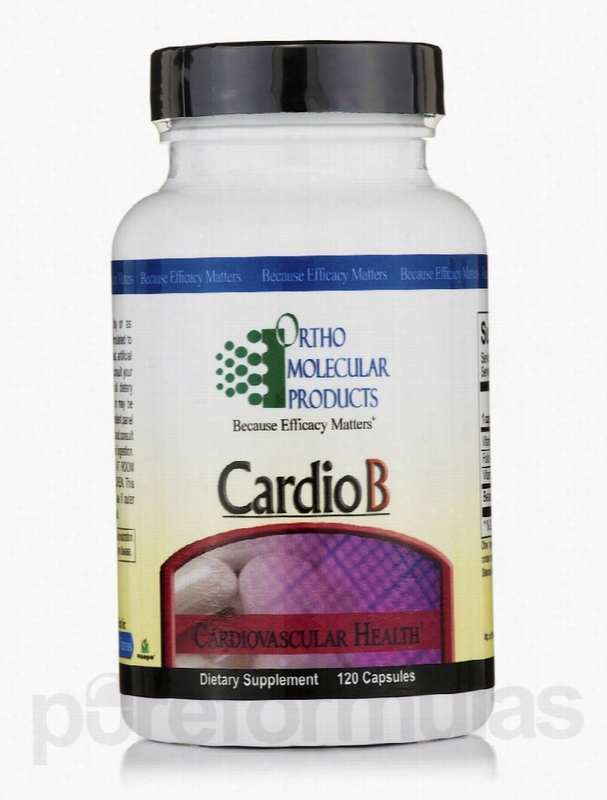 Ortho Molecular Products Cardiovascular Support - Cardio B - 120. Your cardiovascular and bone health are very important. There is an amino acid&mdash;or protein builder&mdash;called homocysteine&sbquo; which is found in blood plasma and believed to contribute to negative impacts on your wellbeing. Studies have suggested that with high levels of homocysteine in your system&sbquo; you&rsquo;re more likely to have reduced mental functioning&sbquo; which can lead to forgetfulness. Both the Hordaland Homocysteine Study and the University of Buffalo suggest that elevated homocysteine levels can also lead to bone weakening. It&rsquo;s even believed that homocysteine may affect lining of the blood vessels to the point that they become scarred&sbquo; hardened&sbquo; and lead to excessive clotting. Ortho Molecular Products&rsquo; Cardio B is a homocysteine-lowering supplement made from a combination of natural ingredients. This formula provides a full dose of beneficial folic acid&sbquo; as well as a therapeutic dose of both vitamin B6 (known to be lacking in the typical diet)&sbquo; and vitamin B12 (a required co-factor in transitioning homocysteine into methionine (an amino acid that&rsquo;s required for good health&sbquo; but that your body doesn&rsquo;t naturally produce). In addition&sbquo; Cardio B contains betaine or trimethyl glycine (TMG)&sbquo; which also helps the liver and kidney convert homocysteine into methionine. Each capsule of Cardio B: Is free of artificial flavors and colors Doesn&rsquo;t contain any corn Doesn&rsquo;t contain any gluten Doesn&rsquo;t contain any yeast Is a fully Vegetarian product The recommended dosage is at least one capsule daily&sbquo; unless otherwise recommended by your doctor. Each bottle of Cardio B by Ortho Molecular Products provides a two to four months&rsquo; worth supply. Ortho Molecular Products prides itself on making effective supplements from scientifically designed formulas. For over 20 years&sbquo; they&rsquo;ve been providing proven products with superior raw ingredients. Their manufacturing practices rise above industry standards and regulations. The most important priority for Ortho Molecular Products is that those who use its supplements get and stay healthy as soon as possible. These statements have not been evaluated by the Food and Drug Administration (FDA). These products are not meant to diagnoseÃ¢ÂÂ treat or cure any disease or medical condition. Please consult your doctor before starting any exercise or nutritional supplement program or before using these or any product during pregnancy or if you have a serious medical condition. 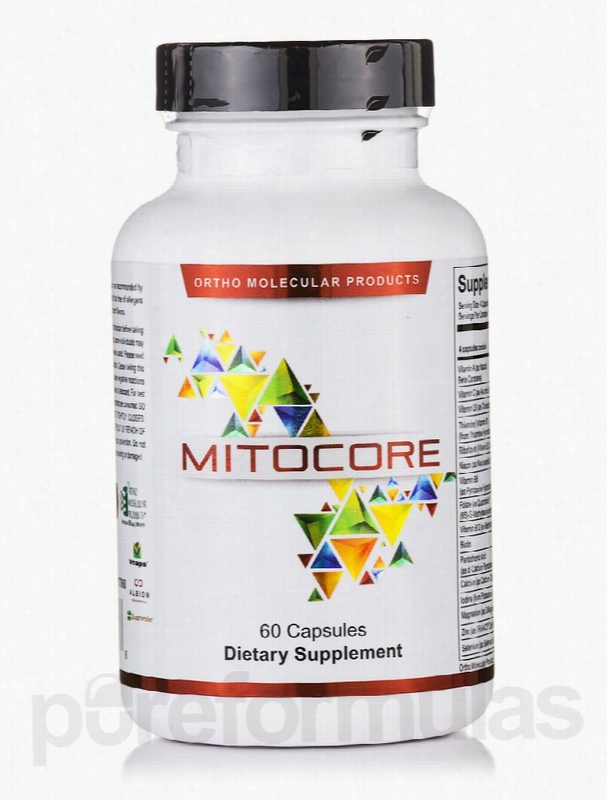 Ortho Molecular Products Cellular Support - Mitocore - 60 Capsules. Unfortunately&sbquo; world is filled with toxic substances: they&rsquo;re in the air you breathe&sbquo; water you drink&sbquo; and foods you eat. These substances are the byproduct of our industrialized world. The addition of man-made chemicals to our environment has been far more rapid than the body&rsquo;s ability to evolve coping mechanisms. Many scientists believe that the stress on the body&rsquo;s immune system while trying to ward off foreign chemicals may contribute to serious illnesses. Still&sbquo; you can&rsquo;t stop living your life to the fullest because of these risks. A supplement like Ortho Molecular Products&rsquo; K-Pax Fuel of Life Immune Support can help you protect yourself. Your immune system needs the support of antioxidants to fight the excessive amount of free radicals (harmful molecules) that are created by those toxic substances. You can get antioxidants in your diet by eating lots of fruits and vegetables&sbquo; but it may be difficult for you to eat enough of them on a daily basis. In that case&sbquo; K-Pax Fuel of Life Immune Support is a convenient alternative. These capsules contain a scientifically formulated blend of nutrients that provides many helpful ingredients&sbquo; such as: 23 different antioxidant Vitamins and minerals&sbquo; which work together to optimize energy output Alpha Lipoic Acid&sbquo; which detoxifies free radicals when cells are under stress Acetyl-L-Carnitine&sbquo; which increases the flow of free fatty acids and boosts energy production N-Acetyl-Cysteine&sbquo; which can significantly stabilize your overall health. The recommended daily dose of K-Pax Fuel of Life Immune Support by Ortho Molecular Products is eight capsules. This 240-capsule bottle will be enough supply for about 30 days. Ortho Molecular Products prides itself on making effective supplements from scientifically designed formulas. For over 20 years&sbquo; they&rsquo;ve been providing proven products with superior raw ingredients. Their manufacturing practices rise above industry standards and regulations. The most important priority for Ortho Molecular Products is that those who use its supplements get and stay healthy as soon as possible. These statements have not been evaluated by the Food and Drug Administration (FDA). These products are not meant to diagnoseÃ¢ÂÂ treat or cure any disease or medical condition. Please consult your doctor before starting any exercise or nutritional supplement program or before using these or any product during pregnancy or if you have a serious medical condition. Ortho Molecular Products Cardiovascular Support - Fiber Plus Capsules. Fiber should form a key component of your diet&sbquo; but if you&rsquo;re like most people&sbquo; it&rsquo;s unlikely that you&rsquo;re eating enough of it. Since plants are high in fiber&sbquo; common dietary sources include fruits&sbquo; vegetables&sbquo; seeds&sbquo; beans&sbquo; and whole grains. Unfortunately&sbquo; processed foods tend to contain relatively little fiber. There are two types of fiber; most fiber-containing foods provide both varieties. Soluble fiber can be broken down into smaller pieces and may support cardiovascular health. Beans&sbquo; lentils&sbquo; and oats are valuable sources of soluble fiber. Insoluble fiber&sbquo; on the other hand&sbquo; is impossible to digest; it travels through your digestive system without being broken into smaller pieces&sbquo; and it aids the other food you consume in traveling through your digestive system with ease. The main role of insoluble fiber is to keep your intestines healthy and prevent constipation&sbquo; or hard stools. Insoluble fiber is an ingredient in fruits&sbquo; vegetables&sbquo; and whole-grain bread&sbquo; brown rice&sbquo; and some breakfast cereals. High-fiber foods can assist you in creating a feeling of satiety after eating&sbquo; making you feel less hungry. If eat a diet low in fiber&sbquo; you may wish to consider adding more fiber-rich foods. Another convenient way to boost your fiber intake is through a supplement. 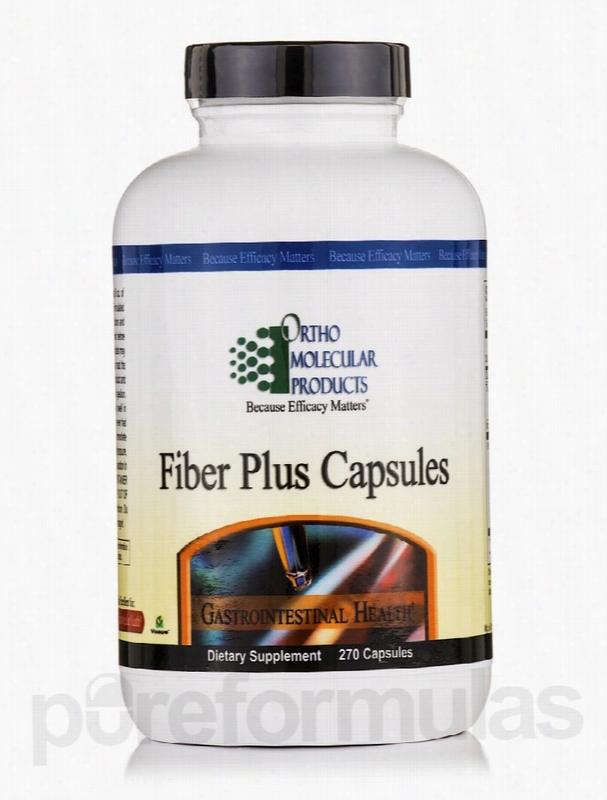 Ortho Molecular Products&rsquo; Fiber Plus Capsules contain natural ingredients that have been designed to provide the bulk your digestive system needs to work normally. Every capsule has a proprietary blend of figs&sbquo; prunes&sbquo; apple pectins&sbquo; rice bran&sbquo; psyllium seed powder&sbquo; and organic psyllium husk powder. These ingredients give you the fiber you need to support digestive health and fullness. A 270-capsule Container of Fiber Plus by Ortho Molecular Products should last approximately nine months at the recommended dosage of one capsule a day. Ortho Molecular Products prides itself on making effective supplements from scientifically designed formulas. For over 20 years&sbquo; they&rsquo;ve been providing proven products with superior raw ingredients. Their manufacturing practices rise above industry standards and regulations. The most important priority for Ortho Molecular Products is that those who use its supplements get and stay healthy as soon as possible. These statements have not been evaluated by the Food and Drug Administration (FDA). These products are not meant to diagnoseÃ¢ÂÂ treat or cure any disease or medical condition. Please consult your doctor before starting any exercise or nutritional supplement program or before using these or any product during pregnancy or if you have a serious medical condition. 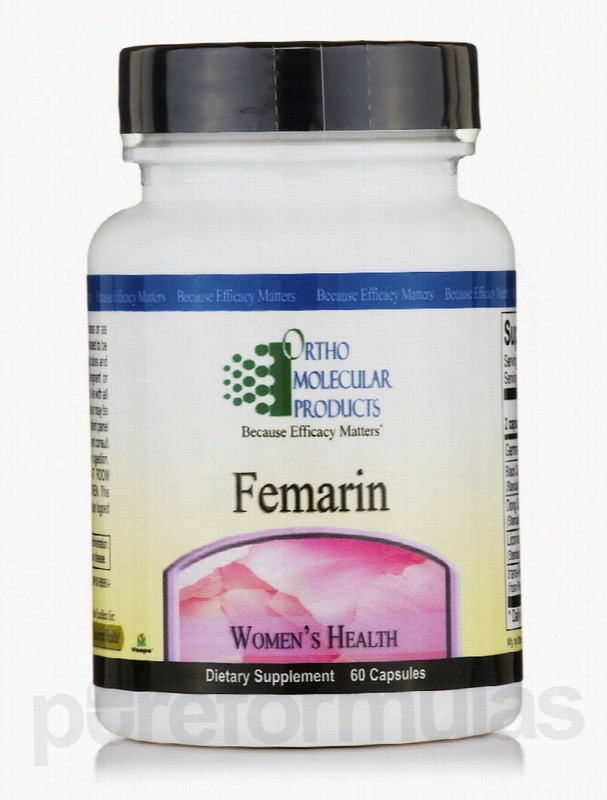 Ortho Molecular Products Women's Health - Femarin - 60 Capsules. Estrogen influences a woman&rsquo;s reproductive years. When estrogen levels begin to decline with age&sbquo; the female body fights back. To reset the imbalance&sbquo; your body releases two other hormones: follicle-stimulating hormone (FSH) and luteinizing hormone (LH). When activated in the presence of low estrogen&sbquo; these hormones can provoke symptoms of hot flashes&sbquo; night sweats&sbquo; sadness&sbquo; and headaches in order to prepare you for menopause. Plant-derived isoflavone therapy could help reduce unpleasant menopausal symptoms and support bone density and heart health. Ortho Molecular Products&rsquo; Femarin may allow you to feel better with relatively few side effects. Each capsule of this natural dietary supplement contains potent botanical extracts that attempt to mimic the function of estrogen in your body. Femarin works to support reproductive functioning minimize the effects of menopause for a better quality of life. This balanced formula of plant estrogen that may help relieve excessive perspiration&sbquo; mood swings&sbquo; bloating&sbquo; and trouble sleeping. The ingredients include: Black Cohosh Root Extract&mdash;a traditional compound of phytoestrogen (plant estrogen) that has the properties of isoflavonoids&sbquo; among other active substances. Protykin&mdash;a medicinal herb and powerful Antioxidant containing resveratrol to help maintains estrogen activity and promote bone strength. Don Quai Root Extract&mdash;a tonic traditionally used to relieve cramps&sbquo; manage an irregular menstrual cycle&sbquo; and alleviate excessive sweating. Licorice Root Extract&mdash;has a mild estrogenic effect potentially useful in decreasing bloat while promoting calmness. This 60-capsule bottle of Femarin will last you from one to two months when taken at the recommended dosage of one to two capsules per day&sbquo; unless otherwise recommended by your physician. Ortho Molecular Products prides itself on making effective supplements from scientifically designed formulas. For over 20 years&sbquo; they&rsquo;ve been providing proven products with superior raw ingredients. Their manufacturing practices rise above industry standards and regulations. The most important priority for Ortho Molecular Products is that those who use its supplements get and stay healthy as soon as possible. These statements have not been evaluated by the Food and Drug Administration (FDA). These products are not meant to diagnoseÃ¢ÂÂ treat or cure any disease or medical condition. Please consult your doctor before starting any exercise or nutritional supplement program or before using these or any product during pregnancy or if you have a serious medical condition. 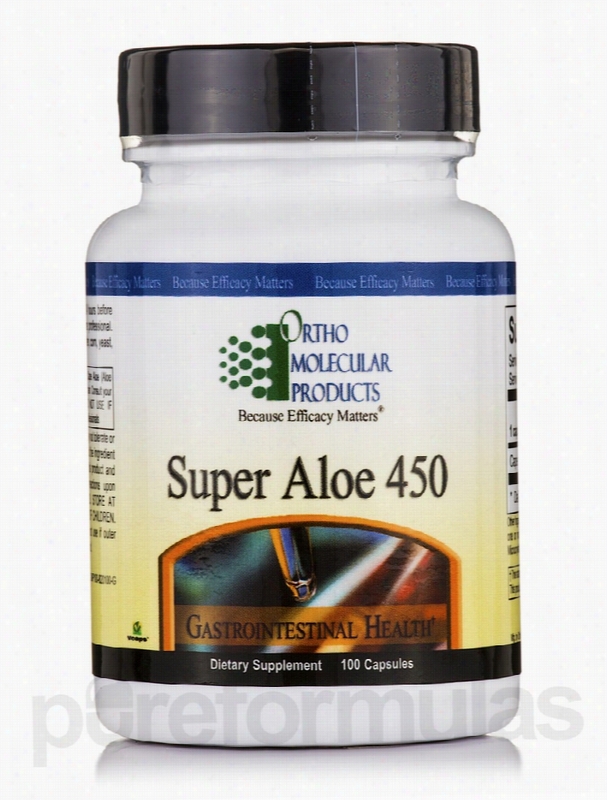 Ortho Molecular Products Gastrointestinal/Digestive - Super Aloe 450 -. Ortho Molecular Products&rsquo; Super Aloe 450 is formulated with high-quality Aloe Ferox&sbquo; and has been carefully developed to deliver quick relief from constipation with a powerful blend of beneficial natural ingredients. Aloe Ferox&sbquo; which is sometimes known as Cape Aloe&sbquo; may have laxative properties that work to purge your intestines and effectively stimulate evacuation of the bowels. It may alleviate symptoms associated with Irritable Bowel Syndrome (IBS) and promote faster wound healing. Super Aloe 450 has been recognized as one of the best supplements of its kind available on the market today. It&rsquo;s the perfect solution if you&rsquo;re looking for a supplement to preserve regularity without a long delay in effectiveness. These capsules are also right for you if you want to avoid the artificial fillers in other products that often result in painful cramping. Synthetic ingredients also tend to hinder the effectiveness of products. Since the primary use of this supplement is as a laxative and cleanser of your internal systems&sbquo; adding artificial substances to the formulation would be counterproductive! Super Aloe is also gluten-free&sbquo; yeast-free&sbquo; and corn-free. Virtually everyone suffers from occasional constipation. Now&sbquo; there&rsquo;s a unique way to deal with it. Each bottle of Super Aloe 450 contains 100 capsules. Ortho Molecular Products prides itself on making effective supplements from scientifically designed formulas. For over 20 years&sbquo; they&rsquo;ve been providing proven products with superior raw ingredients. Their manufacturing practices rise above industry standards and regulations. The most important priority for Ortho Molecular Products is that those who use its supplements get and stay healthy as soon as possible. These statements have not been evaluated by the Food and Drug Administration (FDA). These products are not meant to diagnoseÃ¢ÂÂ treat or cure any disease or medical condition. Please consult your doctor before starting any exercise or nutritional supplement program or before using these or any product during pregnancy or if you have a serious medical condition. Ortho Molecular Products Joint Support - Vitamin K2 with D3 - 60. Vitamin K2 is key to supporting cardiovascular health&sbquo; bone density&sbquo; and blood clotting. A primary benefit of the vitamin is its ability to direct calcium to the proper locations (e.g. your bones and blood) and prevent it from being deposited in the wrong areas. If calcium gathers in the wrong places&sbquo; potential side effects include calcification of the blood vessels and soft tissues&sbquo; as well as painful bone spurs that can interfere with your daily life. Calcium also has a variety of health benefits. Maintaining optimal levels of this mineral depends on the cooperation of several related compounds&sbquo; such as Vitamins D3 and K2. You can get both of these nutrients in one supplement&sbquo; meaning that your calcium intake will be maximized. The blend contained in Ortho Molecular Products&rsquo; Vitamin K2 with D3 may promote bone and tooth health. These capsules are made with an exclusive and effective formula that combines vitamin K with vitamin D&sbquo; a pair of nutrients has been shown by recent clinical research to promote bone health. Vitamin D3 is a valuable nutrient is crucial because of its support for the reabsorption of calcium by your intestines; it also limits the amount of calcium released in the urine&sbquo; meaning that more of the mineral is absorbed and used by your body. D3 is the form your body naturally produces from exposure to unprotected sunlight&sbquo; meaning that it&rsquo;s highly bioavailable. Furthermore&sbquo; Vitamin D3 also stimulates colon health. 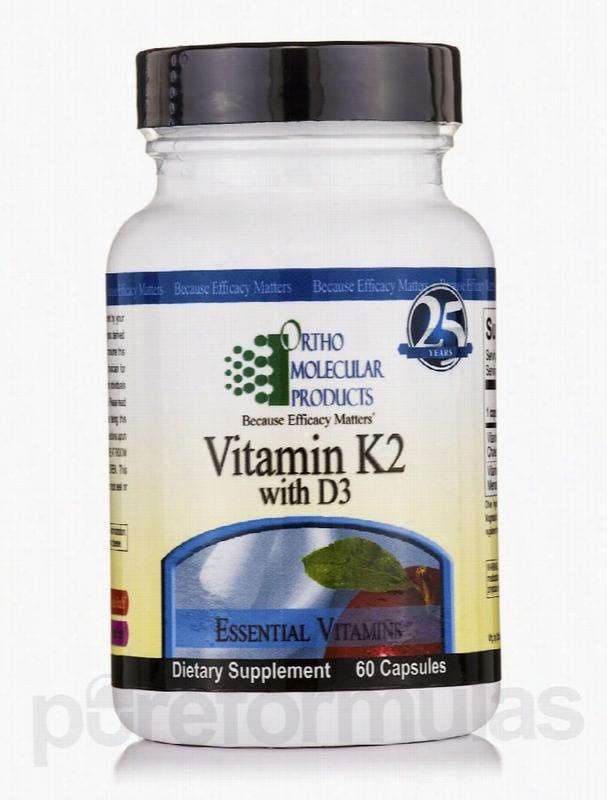 Each bottle of Vitamin K2 with D3 by Ortho Molecular Products contains 60 capsules. Ortho Molecular Products prides itself on making effective supplements from scientifically designed formulas. For over 20 years&sbquo; they&rsquo;ve been providing proven products with superior raw ingredients. Their manufacturing practices rise above industry standards and regulations. The most important priority for Ortho Molecular Products is that those who use its supplements get and stay healthy as soon as possible. These statements have not been evaluated by the Food and Drug Administration (FDA). These products are not meant to diagnoseÃ¢ÂÂ treat or cure any disease or medical condition. Please consult your doctor before starting any exercise or nutritional supplement program or before using these or any product during pregnancy or if you have a serious medical condition.